When I tell people I love art history the question 'why' hangs in the air. Like many academic disciplines, art history has been relegated to text books, distant museums and lists of names and dates. But the history of art is the history of human ambition. The wild and bloody stories of the world’s most transgressive people. Want to smooth-talk your way into wealth and power, redefine gender norms, or get away with murder? Art history is a guidebook for radical change, and Trivium is bringing it online. The world of art is as diverse as humanity itself, but for centuries its household names have been successful white men. And that’s a problem. How can we relate to a canon that doesn’t mirror our world? Trivium digs deep, scouring history to find under-represented artists of all genders, cultures, sexual orientations, and abilities. The best online experiences know how to catch and hold your attention. 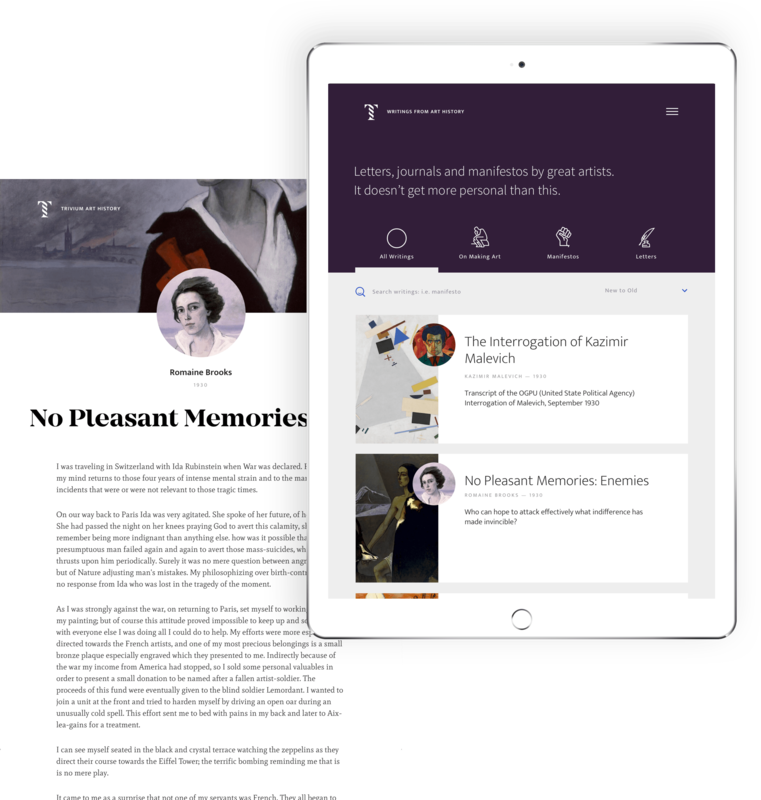 You can get lost in publishers like Medium and Nautilus or inspiration hubs like It's Nice That. Trivium uses snappy headlines and related content to create an immersive editorial experience that always surfaces something new and interesting. In the end it always comes down to content. Art history writing is mostly academic, intended for an audience already familiar with the subject. Trivium focuses on storytelling, offering tight, entertaining biographies and essays. Rigorous research delivered in a casual style that makes art history approachable and fun. To capture attention, Trivium pairs bold visuals with snappy headlines. It's a tactic shamelessly stolen from editorial design. Magazines and newspapers have honed the art of the attention grab, why not apply it to education? 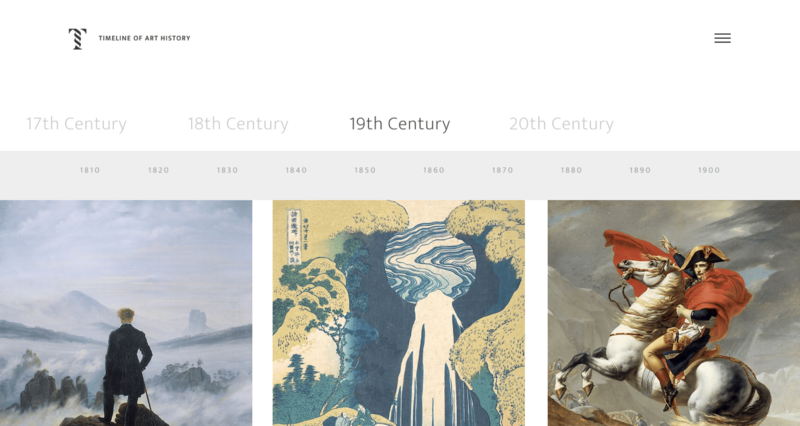 Categorizing thousands of years of art requires a vast array of technical taxonomies — but adding human interest categories provide friendlier entry points. Site structure should provoke curiosity. When designing for immersion it helps to have access to analytics — to identify how users are moving through your site. In Trivium's case, I learned early-on that our visitors arrived most often on artwork detail pages. With that in mind, the artwork pages became mini-landing pages, with big, visual links to the associated artist and movement pages. 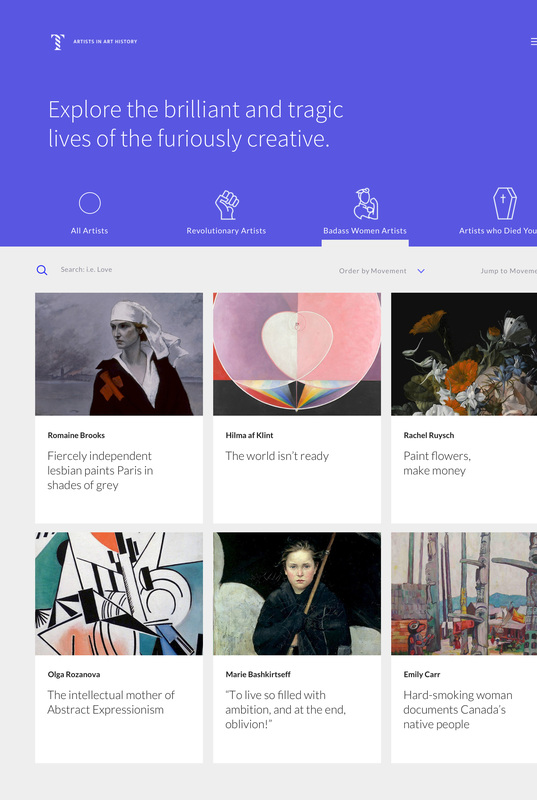 Artworks are also tagged to allow exploration by theme. If the user just wants to look at every painting of horses in history, they can. A detail page should attempt to guess why the user is there, and curate options for where to go next. I designed and built Trivium from scratch, every page, every line of code — I get up each morning at 5am to add content, develop new features, and work with our growing network of collaborators. It's also a playground, a place for me to test theories and stay current with SEO, optimization, taxonomy and recirculation strategy. Here's a brief list of the details. Building a new canon for art history is a big job. Working with artist and educator Rick Love in collaboration with a small team of excellent writers, scholars and students we add new content each week. Our goal is to have a full textbook replacement by 2017. Our current audience is small, passionate and global — with 3/4 of our readers arriving from outside the United States. Trivium is currently not monitized, which has allowed us to reach out to schools as free resource and opportunity to contribute to art history. I'm always happy to chat about Trivium, feel free to reach out if you've got questions or are curious about contributing to the project. And at the very least, check it out.